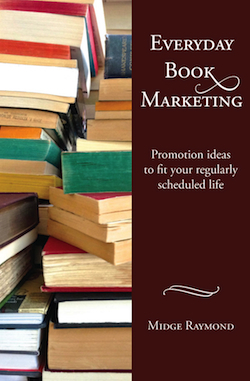 Midge Raymond, the author of Everyday Writing: Tips and prompts to fit your regularly scheduled life as well as the wonderful short story collection Forgetting English (Press 53, 2011) has now published an extremely helpful guide to book marketing. It doesn’t matter whether your book is forthcoming or long since published, or if it will come from a big press, a small press, or be self-published, you’ll find this book filled with tips you can use. The book includes a detailed discussion of the marketing process, starting with the important advice that the author should begin taking steps to market the book long before the book is actually published. But it goes on to provide a thorough discussion of blogging, platform building, contact-list building, websites, review copies, the book launch, and what to do next. In addition, however, a significant portion of the book is devoted to question and answer sessions with authors (including those who are traditionally published and self-published; fiction writers, memoirists, poets; best-sellers and emerging writers), publicists, event coordinators, and others. These sections are fascinating and give the reader great insights from people who have been there and done that. I have one minor complaint about the book, and that is that there is some wonderful information in the Q&As with the authors and publicists, but it can be a little hard to find. Some of these items are mentioned in the corresponding sections of the main text, but not all of them are. An index might be helpful, but in the meantime you might want to take notes as you’re reading the book–or make notes in the margins or tab pages with post-it notes–when you come across something you know you’ll want to come back to later. Not that it would hurt you to reread the book to find these gems, but there’s only so much time in the day. Which is exactly why this book can be so helpful. Can I order Midge Raymond’s book Everyday Book Marketing on my Kindle?